The great folks at GKIDS are back with a new entry for Studio Ghibli Fest! 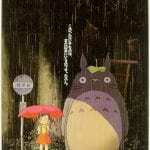 Don’t miss your chance to see Hayao Miyazaki’s delightful fantasy film My Neighbor Totoro. This special film is coming to theaters September 30 (Dub) and October 1 (Sub), October 3 (Dub). Often looked at as Japan’s answer to Winnie the Pooh, My Neighbor Totoro takes the viewer on a sweet and heartfelt journey of childhood, loss and magic. Many got to see this special film on the big screen last year and Studio Ghibli Fest gives us a second chance if you missed it! Starting today, you can enter to win a pair of tickets to see My Neighbor Totoro and you won’t want to miss it!